PoppyCat News: Altered Box - Count your life with smiles! 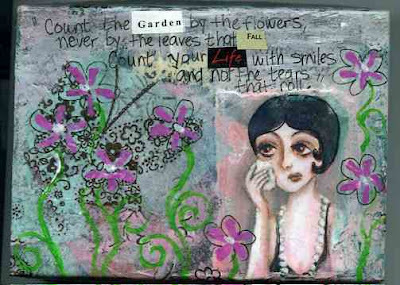 Altered Box - Count your life with smiles! "Count the garden by the flowers, never by the leaves that fall. Count your life with smiles and not the tears that roll." I altered this box that once held tubes of acrylic paint. I used a little reproduction of a painting that I did earlier this year. That was collaged with tissue paper, and the quote and acrylic paint were added. Once I collaged and varnished it, the box wasn't fitting together like it originally did. So I glued thin rope around it to act as a stopper, to keep the lid from getting stuck. It's a little funky, but the textures make it fun to hold. And the size is perfect for holding some special little trinkets, or would make a wonderful gift box. Approx 5 x 3.5 x 1.75 inches. I've got 4 more of these little boxes, so I look forward to making more. Oh, those boxes are lovely! What a great little treasure box, and recyled too! Great art and fun suggestions! I'm such an etsy fan. I get lost browsing for hours. This is a Flickr badge showing public photos from poppycatstudio. Make your own badge here. I'm an artist, mom and sometimes art teacher. I'm also one of the founding members of a successful volunteer-run art program at my son's school. I live a busy yet somewhat simple life in the mountains of Southern California. 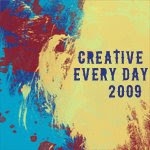 Art is very important to me, and I try to live creatively each day. I'm basically self-taught, learnin by doin. I have an eclectic mix of interests and it shows in my work. I try to focus on the happy things in life. I love lots of color, but I also like to do pen and ink drawings. I just can't stick with one thing, so I'm always trying something new.